Welcome to The Duality! This page is a quick summary of who we are and what we do! Well hello there. I’m Emmet, otherwise known as Voice M on this here blog. To the surprise of nobody, I’m sure, I represent the more masculine elements of the writings on here. 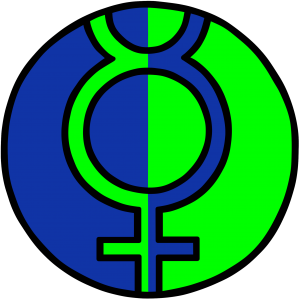 Given that The Duality is intended to be an exploration of the changes our viewpoints on our gender and how we’ve grown, I’ll typically be playing more of an interviewing role. Let’s face it, I’ve been in the driving seat for most of our life, so in terms of the journey we’re going through I have less to add, but by asking questions I do hope to provide perspective. I’ll also typically be the source of acerbic wit and abundant sarcasm, as that’s how I typically see things. It helps keep Effie on track, rather than both of us dissolving into a puddle of rage at certain subjects. Hey, I’m Effie, though I’ve also been called Voice F here. I’m here to provide a voice to our feminine nature. I’m a little newer on the scene, so to speak, and am still finding my feet somewhat. That’s not to say I’m less fully formed than Emmet, of course. As we’ll surely discuss, I don’t think these attributes are new to us at all. We’ve just never really had a way of putting them into words, a way of making these sensations coalesce and become less ephemeral, prior to my own development. I’ll likely be the more vocal on the blog, with Emmet fielding questions and helping me dig deep into whatever topic we’re dealing with. Thank you for joining us here, and I hope you continue to enjoy our writings. Hi. So I’m the one behind both Emmet and Effie, but for safety’s sake I’m going to be sticking with the pseudonym of The Author. You will likely not be hearing from me very much, beyond this intro and occasional announcements. This is very much the domain of Emmet and Effie, but it didn’t seem right to have this page and not make some kind of introduction. So, here I am. Just to clarify, by the way, Emmet and Effie are very much characters and creations of my imagination, rather than distinct individuals dwelling in my mind, just in case anyone wants to try and make inaccurate accusations about my state of mind to dismiss this blog. That doesn’t diminish what they represent, though, and I hope seeing these two different elements of my personality mix and intermingle as they do on this blog is as informative to you as has been for me thus far. Thanks for reading, and all the best.